Gizzi Erskine is the latest chef to guest at Disco Bistro N1C, the diner at the Skate Kings Cross roller skating rink. 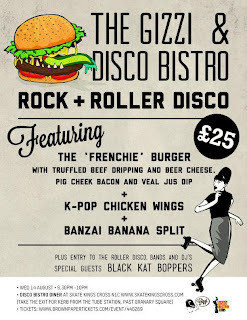 £25 gets you very intriguing 3 course meal, including K-Pop Chicken Wings & a Rock n Roller Burger. "For one night only Gizzi Erskine will be taking over the Disco Bistro diner at Skate King’s Cross, for a night of live Rock n Roll from the Black Cat Boppers, Gizzi's signature Korean style burger menu, smoked Chase vodka cocktails and she's even going to throw in a DJ set to boot. Having collaborated with 'punk' chef Carl Clarke (Disco Bistro) on several projects before including K Town - a Korean pop-up at Concrete in Shoreditch, Gizzi At The Disco - a chicken and doughnut night at Disco Bistro, EC4 and Gizzi's Kitchen Party Tent at Latitude...they are both ADHD when it comes to food and serving it without any pretension or snobbery. 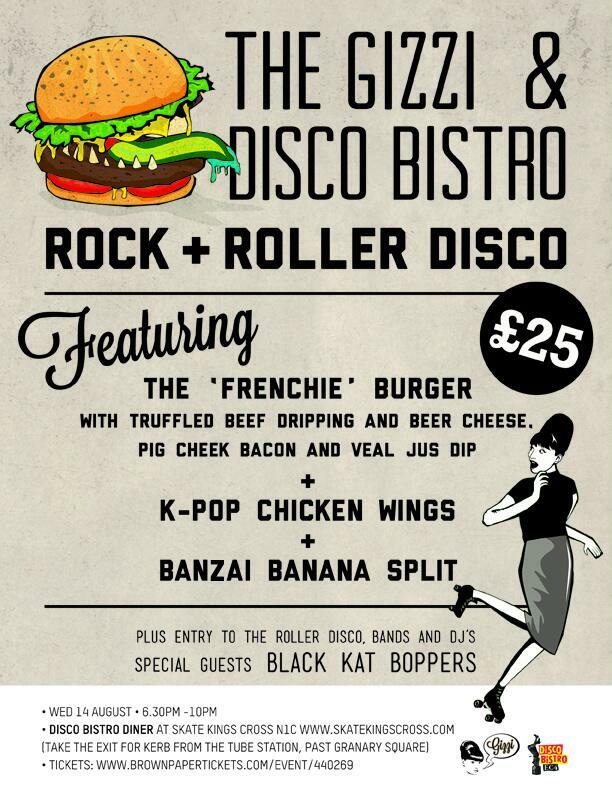 This is the ultimate combo of Rock and Roll, a Rocking menu and a Rock n Roller Disco!